See Also our Booze Cruises, Private Catamarans and Party Circuit Tours! Sip on champagne, wine, or cocktails as you feel the wind in your hair or hear it billowing in the sails while you prepare to sit down for a romantic lobster dinner on board or on the beach. Romantic live music accompanies you as you sip wine and gaze into each others eyes before you set sail for home. 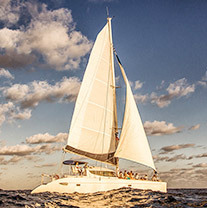 Our Cancun Sunset Cruises are very romantic, especially the private sunset cocktail cruise where you have the whole sailboat to yourself - popular for weddings, anniversaries, or engagements. Many marriage proposals take place on this cruise because it is so perfect.